Endothelial colony-forming cells (ECFCs) are stem-like cells found in umbilical cord blood that help repair damaged blood vessels. They may hold promise for the treatment of stroke, heart attack and blocked leg arteries. However, their rate of blood vessel repair is slow when they are injected into the body. 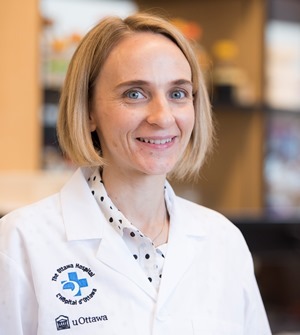 Dr. Marjorie Brand and her team found a way to boost ECFCs’ repair ability in a study published in Stem Cell Reports. The team learned that blood vessel repair pathways are slowed down in ECFCs, and need to be activated by signals from the environment. Dr. Brand’s team was able to improve the repair ability ECFC’s by treating them with a combination of epigenetic drugs before transplanting them into an animal model with damaged blood vessels. These pre-treated ECFCs were better at migrating to the damaged area, and helping to form new blood vessel networks. The pre-treated ECFCs also restored blood flow in animal models much faster, which is important for saving organ function. Funding: This research was possible because of generous donations to The Ottawa Hospital for Regenerative Medicine research. The researchers also received support from the Canadian Institutes of Health Research, the Department of Medicine, University of Ottawa, the Heart and Stroke Foundation of Canada, and the Cushing Fund.